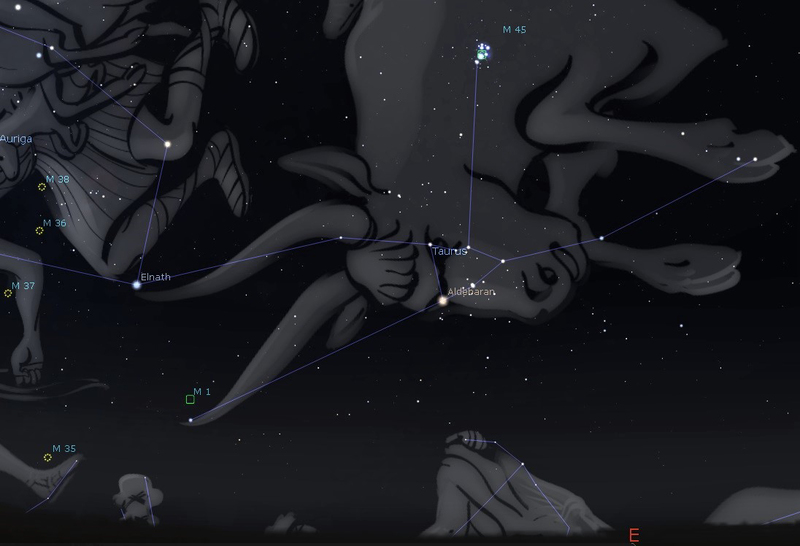 The constellation of Taurus the Bull has completely cleared the eastern horizon by 6:30 pm this week. It is distinguished by two relatively close star clusters: the compact dipper-shaped Pleiades in the bull’s shoulder and the V-shaped Hyades that forms the bull’s face. The bright orange star Aldebaran anchors one side of the V, representing the bull’s fiery eye, but it is not actually part of the cluster as it is much closer. Both clusters are a delightful view in binoculars. In a couple of weeks comet 46P/Wirtanen passes between them but a dark transparent sky might be needed to see it. In mythology the Pleiades (aka the Seven Sisters) and the Hyades were half-sisters; daughters of Atlas, who obviously didn’t spend all his time holding up the sky. Starting from the apex of the Hyades, extend each side of the V outward to a star. These stars are the tips of the bull’s horns. The upper star is Alnath, which forms one of the corners of Auriga the Charioteer although it is officially part of Taurus. The other horn star has a famous dim neighbour, which is about one degree away and slightly to the right of a line joining the horns. Called the Crab Nebula or M1 for being the first entry in Charles Messier’s 18th century catalogue, this little fuzzy patch is a gaseous supernova remnant. The supernova, a death-explosion of a giant star, was seen in daylight for three weeks in 1054. I have seen M1 in a transparent sky with binoculars but a scope gives a better view. Saturday’s sunrise in Moncton is at 7:40 am and sunset will occur at 4:35 pm, giving 8 hours, 55 minutes of daylight (7:43 am and 4:43 pm in Saint John). Next Saturday the Sun will rise at 7:48 am and set at 4:33 pm, giving 8 hours, 45 minutes of daylight (7:50 am and 4:41 pm in Saint John). The Moon makes a tight triangle with Venus and Spica on Monday morning and is at the new phase on Friday morning. Saturn is low in the southwest in twilight, heading toward conjunction on January 2. Mars remains in good observing position most of the evening and it passes very closely to Neptune on Thursday and Friday. Venus, the morning star, is at its brightest or greatest illuminated extent on December 1. As it pulls ahead of us in orbit its angular size decreases but we see more of its sunlit half. Jupiter and Mercury will be better placed for morning observers in a week or two.